Voltaire | Vorwärts und nicht vergessen! Voltaire purchased a chateau in Geneva, where, among other works, he wrote Candide (1759). To avoid Calvinist persecution, Voltaire moved across the border to Ferney, where the wealthy writer lived for 18 years until his death. Voltaire began to openly challenge Christianity, calling it „the infamous thing.“ He wrote Frederick the Great: „Christanity is the most ridiculous, the most absurd, and bloody religion that has ever infected the world.“ Voltaire ended every letter to friends with „Ecrasez l’infame“ (crush the infamy–the Christian religion). His pamphlet, „The Sermon on the Fifty“ (1762) went after transubstantiation, miracles, biblical contradictions, the Jewish religion, and the Christian God. Voltaire wrote that a true god „surely cannot have been born of a girl, nor died on the gibbet, nor be eaten in a piece of dough,“ or inspired „books, filled with contradictions, madness, and horror.“ He also published excerpts of Testament of the Abbe Meslier, by an atheist priest, in Holland, which advanced the Enlightenment. 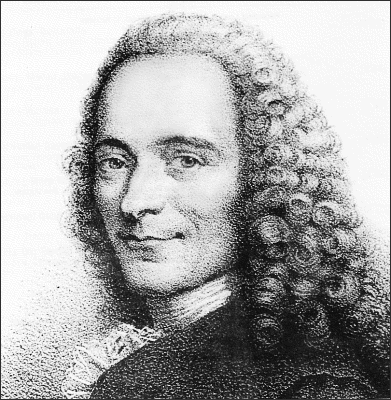 Voltaire’s Philosophical Dictionary was published in 1764 without his name. Although the first edition immediately sold out, Geneva officials, followed by Dutch and Parisian, had the books burned. It was published in 1769 as two large volumes. Voltaire campaigned fiercely against civil atrocities in the name of religion, writing pamphlets and commentaries about the barbaric execution of a Huguenot trader, who was first broken at the wheel, then burned at the stake, in 1762. Voltaire’s campaign for justice and restitution ended with a posthumous retrial in 1765, during which 40 Parisian judges declared the defendant innocent. Voltaire urgently tried to save the life of Chevalier de la Barre, a 19 year old sentenced to death for blasphemy for failing to remove his hat during a religious procession. In 1766, Chevalier was beheaded after being tortured, then his body was burned, along with a copy of Voltaire’s Philosophical Dictionary. Voltaire’s statue at the Pantheon was melted down during Nazi occupation. D. 1778. “Atheism is the vice of a few intelligent people. Sect and error are synonymous. Good blog! I truly love how it‘ s easy on my eyes and the facts are well written. I am wondering how I can be notified whenever a new post has been made. I have subscribed to your rss feed which should do the trick! Have a nice day! Voltaire | Hermanitous Blog is an impressive share. Thank you for this article.